If you’re starting out in your career or looking for a change in career, you might not know exactly what you want to do yet. But perhaps you do know you want to make a difference. As a large world class organisation we offer a wealth of opportunities to start shaping your professional life. Whether you’re an IT whizz, have a way with words or a head full of fundraising ideas, we’ll nurture your talent and show you what it’s like to have a job that really matters. Our Retail Graduate Programme is a 24 month structured scheme aimed at developing retail managers. As the largest and most successful charity retailer in the UK, with over 700 stores and a strong online presence, our programme offers a great opportunity for a talented graduate. Through hands on training across our fashion and furniture & electrical stores, regular feedback and challenging assignments, our graduates will be well-equipped for an enterprising career in retail. From running a store and job shadowing to taking on regional projects, graduates will be expected to show initiative by taking on responsibility, sharing their learnings and making the best use of the extensive development opportunities within the BHF. We’re looking for people with great passion for customer service and problem solving. You’ll be a great team player with strong networking and communication skills. So if you’re a graduate with ambitions for a career in retail, we can offer you the entrepreneurial environment, hands on training and expert knowledge that will get you on track for success. We’ll provide you with a warm induction to the Retail Team, as well as the wider BHF. You’ll have complete access to all of our learning and development opportunities, including Workday, our state of the art online learning portal, as well as a huge range of workshops. By the end of the first six months, Retail Graduates will be fully equipped with the essentials of store management and demonstrate readiness to take on extra responsibilities. And by the end of 18 months, Graduates will have a more rounded understanding of retail operations in a large, complex organisation. Throughout the programme you’ll be delivering on regional projects and continuously building your skillset, all to prepare you for a future career in retail. I was attracted to this programme because it sounded like it would provide me with the opportunity to work within an exciting environment in which I would be able to both grow and develop professionally, as well as personally. The best part for me so far has been learning about different areas of the company and becoming more familiar with how the charity operates. Our award-winning People and Organisational Development Team are excited to offer a new graduate programme. Over 24 months, graduates will have exposure to several different teams within People & Organisational Development, enabling them to have an immersive introduction to the world of HR & Talent. Based across central London and Surrey, our HR teams are experts in areas like recruitment & resourcing, learning & development, and digital HR systems. 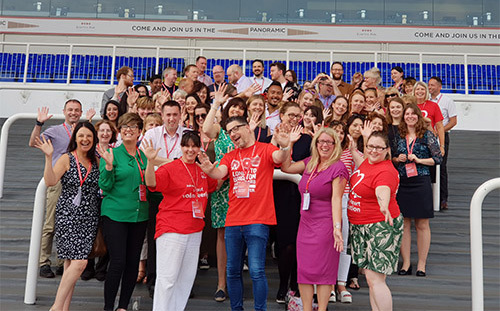 We’re looking for team players with great communication skills, who are confident networking with internal and external stakeholders, and can deliver great customer service to their BHF colleagues. You’ll receive a thorough induction to the People & Organisational Development Team, as well as the wider BHF. All of our learning and development opportunities, including Workday, our state of the art online learning portal, as well as a huge range of workshops, are available to you. By experiencing the multi-faceted areas of HR, you’ll be continuously challenged and given opportunities to develop new skills. After the 24 months you’ll have the experience and knowledge to equip you for a flourishing career in HR. We’re thrilled to welcome motivated and diverse graduates looking for a successful career in HR into our POD family. Our team is undertaking really innovative work and we are excited about the enthusiasm and skills a graduate can bring to our projects and services. HR is a world rapidly evolving thanks to technology, so if you’re looking for a cutting-edge career, we want to hear from you! Together with Macmillan Cancer Support we deliver the Gradunique development programme for graduates who are ambitious to work in the charity sector. The two year programme gives exceptional graduates the opportunity to work, full time, in paid positions for both charities - 12 months in each. This unique partnership between the BHF and Macmillan Cancer Support provides incredible exposure to the sector. 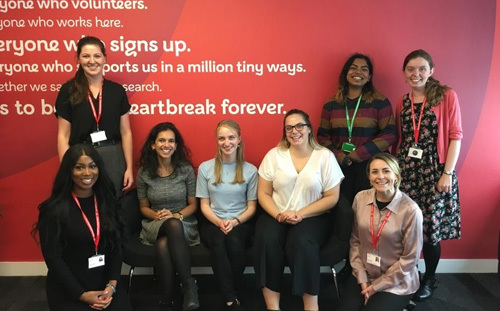 You'll gain hands-on experience across a wide range of functions in two of the UK's leading charities and the chance to make vital connections. Each year we’re looking for four recent graduates. To be successful, you'll need to show us that you are passionate about making a difference and ready to take on responsibility while working with others. We want graduates who are excited by the prospect of making a real impact on others' lives. You'll need to be accountable from day one, and hungry to learn from those around you. For further details, please visit please visit www.gradunique.org.uk. I feel so lucky to have been part of Gradunique… I’ve got to work across teams, directorates and organisations which has meant that I’ve gained a huge variety of skills and knowledge, and I’ve got to understand the charity sector in a far more broad sense than what I could have hoped for in any other setting. Having finished the graduate scheme, I’m now in a management level role at one of the host organisations – I don’t think I could have hoped to get this sort of role without Gradunique!